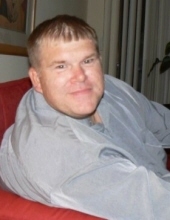 DURHAM: William Wade Copeland, 51, passed away on Monday, March 18, 2019. He was born July 15, 1967 in Durham County. Mr. Copeland was preceded in death by his father, Earl Wade Copeland. Will’s passions were fishing and baseball. Mr. Copeland is survived by his mother, Cyd West Copeland; sister, Paulette Corry and husband, David; brother, Allen Dunlap Copeland; two nieces, Andrea Copeland and Carla Copeland; and nephew, Damon Frazee. A memorial service will be held at 2 p.m. on Saturday, March 23, 2019 at Clements Funeral Chapel with the Rev. Mark Stephens officiating. In lieu of flowers, donations can be made to St. Paul United Methodist Church, 2700 N. Roxboro St. Durham, NC 27704. The family is being assisted by Clements Funeral & Cremation Services, Inc. in Durham. Online condolences may be sent to www.clementsfuneralservice.com. To send flowers or a remembrance gift to the family of William Wade Copeland, please visit our Tribute Store. "Email Address" would like to share the life celebration of William Wade Copeland. Click on the "link" to go to share a favorite memory or leave a condolence message for the family.